Gherkin and Caramelized Onion Dip - Bake.Eat.Repeat. 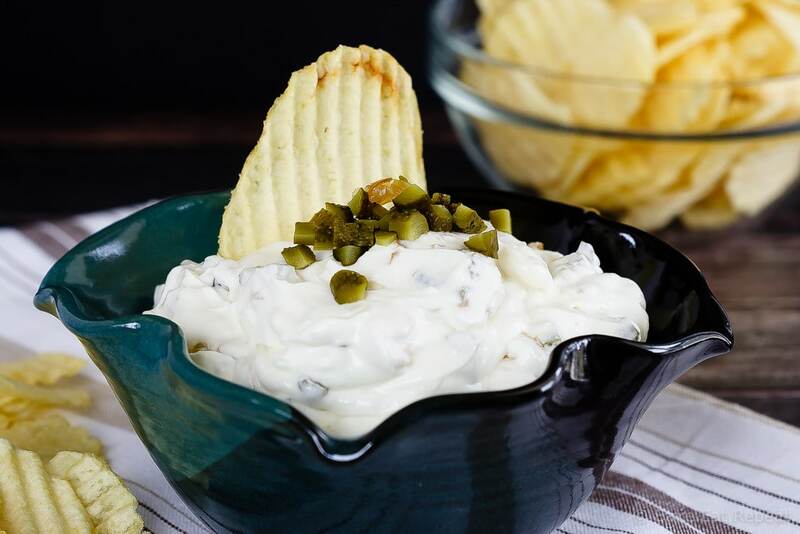 This gherkin and caramelized onion dip makes the perfect appetizer or snack – easy to make, and so tasty, you’ll never want to buy chip dip again! Plus, a great giveaway from Maille Canada! Fun food today! Because chip dip is just plain fun. I don’t know why, it just is. Because that’s what you serve at parties maybe? In my mind, chip dip goes with playing cards. That’s when it always seemed to make an appearance in my house. When lots of people were around, and generally when we were playing cards. Family gatherings + cards = chip dip. So obviously it’s fun food. That’s just math. My favourite kinds of chip dip have always been French onion and dill pickle. So when I had the opportunity to come up with a recipe using Maille’s new Gherkins with Caramelized Onions, chip dip was clearly my first idea. Pickles and caramelized onions all in one dip? That’s my idea of the perfect snack! Granted, there’s no dill in these pickles, so it’s not dill pickle. But that’s okay, because these gherkins have so much flavour. I’ve actually never loved gherkins, I always thought they were a little too sweet. But these new gherkins with caramelized onions? Seriously, so good. I had to rush to get my recipe testing done before my family and I devoured them all! They’re amazing. So even if you don’t typically grab the gherkins off the pickle tray, you should probably try these ones. I know I’ll be getting them again. And I will likely be making this gherkin and caramelized onion dip with them fairly often. We ate far too much of this the day I made it. Although, when does anyone ever have chip dip and not eat far too much? Is it even possible to stop after only a little bit? If you can, don’t tell me – I’d like to go on believing that everyone lacks self control around chip dip! 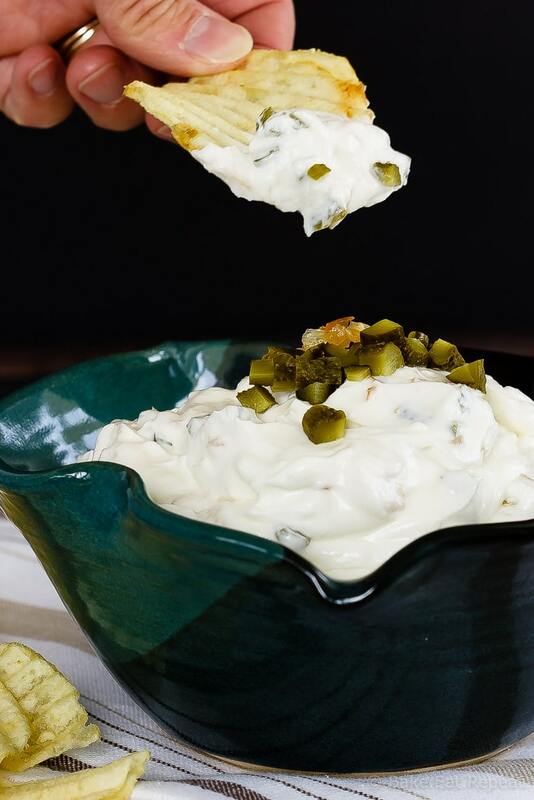 If you’re looking for an easy snack to make, try this gherkin and caramelized onion dip. It’s super easy to make – caramelize some onions, mix a few things together and chill the dip for a few hours. That’s it. And then you have a happy family. Because chip dip is fun! If you would like to try out these new Maille Gherkins with Caramelized Onions, you can find a $2 off coupon by clicking here. Plus, the lovely people at Maille Canada have offered to give away a basket (valued at $50) to one of my readers that will include Maille’s new Caramelized Onion Cornichons, Maille’s core mustards—Honey mustard, Dijon Originale, and Old Style Dijon, as well as some other products. To enter, just leave me a comment below telling me what you would make with Maille’s new Gherkins with Caramelized Onions! *Giveaway is open to residents of Canada aged 18+. Giveaway is open now until Thursday, October 13, 2016 at midnight (MST). Winner will be randomly selected and notified within 24 hours of the contest closing. Winner must respond with mailing address (no PO Boxes) within 48 hours of email notification or a new winner will be selected and must answer a skill-testing question. Prize will be delivered to a street address by Maille Canada. Giveaway closed. Disclaimer: This post was sponsored by Maille Canada and I have been compensated for my time and provided with product for recipe testing purposes. 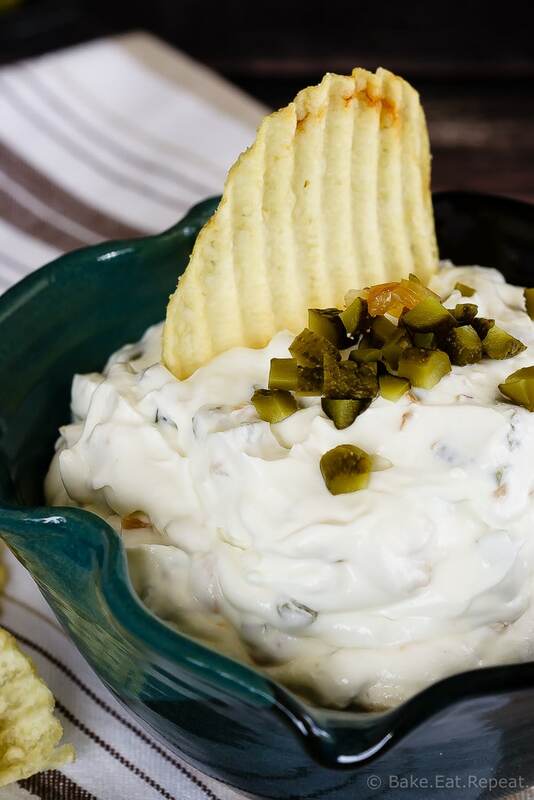 This gherkin and caramelized onion dip makes the perfect appetizer or snack - easy to make and so tasty, you'll never want to buy chip dip again! In a skillet over medium heat, melt the butter. Add the diced onions and cook, stirring until softened. Reduce the heat to medium low and continue cooking, stirring often, until the onions are golden brown and caramelized, 35-40 minutes. Remove from heat and let cool. In a medium bowl, with an electric mixer, whip the cream cheese and sour cream until smooth. Stir in the caramelized onions, chopped gherkins, garlic powder and onion powder. Chill for 3-4 hours before serving. I'd make some kind of filling to stuff into jalapeño poppers with it. This dip looks so yummy! I love any kind of pickle. Great giveaway. Thank you. Looks like a tasty dip. TBH, I'd probably eat them straight from the jar. This recipe made me a subscriber. Thank you! I'd try to make a unique version of German rouladen, using the Maille Gherkins with Caramelized Onions. Thanks Tara! Glad you like the recipe! Love the German rouladen idea, that would be amazing! 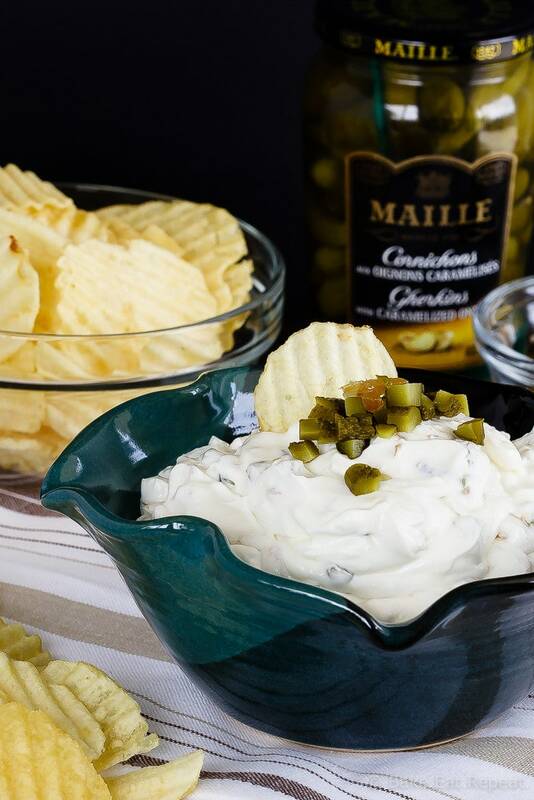 I would make potato salad with Maille's gherkins with caramelized onions. I'd so want to try that dip with caramelized onions! that our add it to any pasta sauce to give that added depth. I'd definitely try deep fried pickles with these. They sound so tasty! We use dips all the time, this sounds good. Sounds scrumptious! Can't wait to try it! Looks yummy! Thanks for the coupon link. Yum, love Maille products. I think the gherkins & caramelized onions would be great in tartar sauce! Talk about taking your fish to another level! I love chips and dip but haven't had any in too long. I should try this dip! This chip dip looks amazing! Funny that Gherkins should come up on your blog, just as I'm thinking about plans for Thanksgiving dinner. Christmas and Thanksgiving are the two dinners that we absolutely HAVE to have gherkins in the house! I've never really thought about which brand to use, but I'll definitely go out and pick up this one (Maille) just because you said so!!! lol (talk about trust!) I'm also eager to try out the dip recipe, too. It looks yummy, Stacey. Wow this dip looks so good! Realistically, These onions and pickles would go all over every burger I make! Yummm! Can I just eat them out of the jar?! Haha. Hmm, this is a tough choice. Maybe a potato salad! I seriously hid them at the back of the fridge so they wouldn't all just disappear straight out of the jar before I made my recipe! They're really good. And now I need to try them in potato salad cause that sounds fantastic!